20120202 - Up worked all day and then out and threw the football with D&G till dark/dinner. 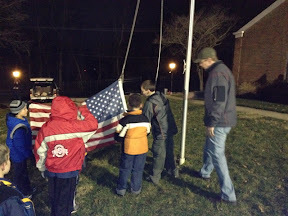 DJ&I to Scouts and raised the Flag, cooked hot dogs (L&G had to bring them, i forgot them) and s'mores. To Grossls for a biz meeting afterwards and Scott S stopped by. Home boys to bed in basement vegin out with Youtube playing.